We are proud Pechites. What’s a Pechite? Pechites are devotees of PECHE’s superb desserts, pastries and swoon-worthy breakfasts and lunches. At our last T&T Bloggers’ Table we were anxious to add PECHE PATISSERIE to our restaurant wish list. Thankfully Chef Khalil Ali made it happen and a few weeks later our foodie gang happily descended on PECHE — Corey-Learning Patience, Q-Bring It to the Table, Sharon-Chutney Garden and Sarina-TriniGourmet. As cameras and notebooks were being unpacked we popped into the kitchen to say hello and practically swooned when we saw the menu! It read like a feast of the sea — Crab Legs, Tandoori Shrimp, Oysters Rockefeller, Raw Oysters, Egg & Smoked Salmon Salad and more. 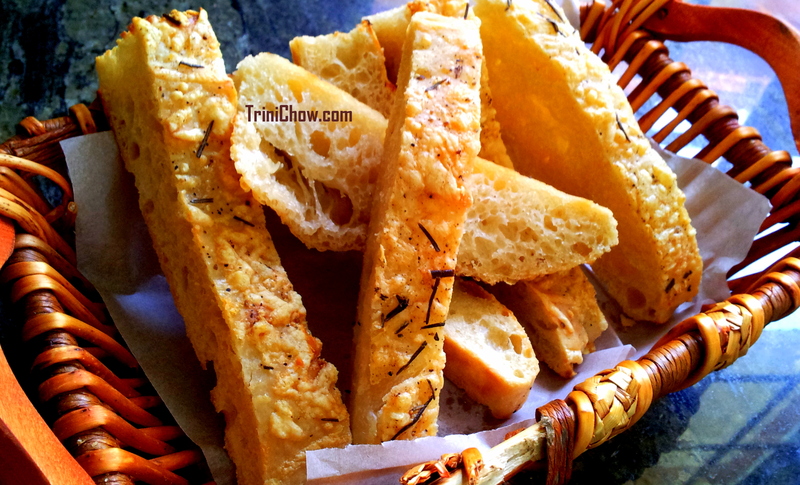 First to the bloggers’ table were baskets of tasty times two — a Focaccia studded with rosemary and an Olive Fougasse. Both were quickly sampled and then common sense prevailed as our mouth and hands received a “must not fill up on bread” message. PECHE oysters arrived next in the form of Oysters Rockefeller and Raw Oysters (pictured below). Bravery was called for here because despite the pretty presentation and the lovely-tasting Horseradish Chimichurri (the sauce in the middle), the sight of raw oysters unleashes the squeamish in us. Instead we led with the luxurious Oysters Rockefeller, perfect for the less food-adventurous folks at the table. PECHE serves these local (!) 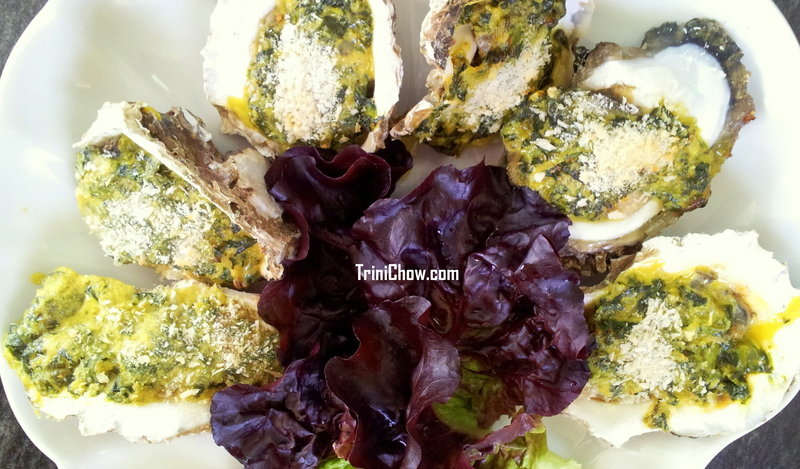 oysters on the half-shell, topping them with a roasted creamy herb, spinach and panko bread crumbs mixture. Bow your head and thank New Orleans for this dish, which originated at Antoine’s, a famous Louisiana Creole restaurant established in 1840. PECHE PATISERRIE does New Orleans’ Oysters Rockefeller justice though with an intensely rich sauce and topping that plays well against the brininess of the lightly cooked oysters. We’re sad to report that we chickened out and didn’t try the raw oysters. 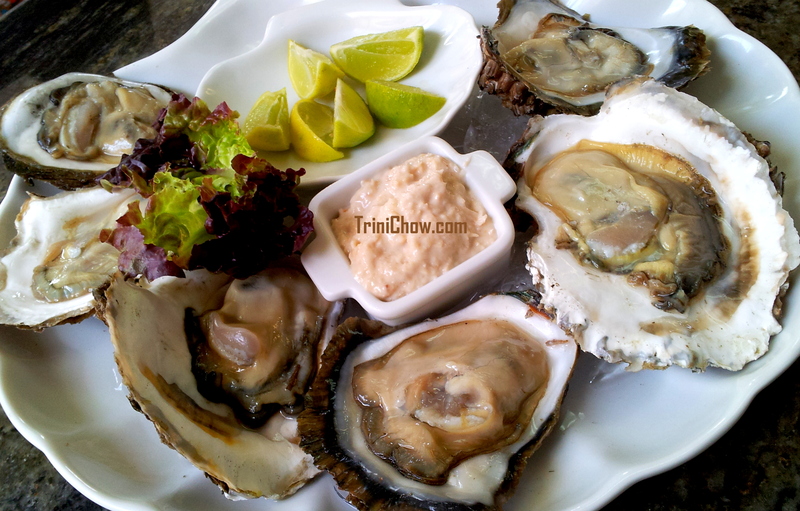 Thankfully, Sharon, our brave comrade in all things food, absolutely adores oysters in all their iterations and reported that the Raw Oysters were fantastic. 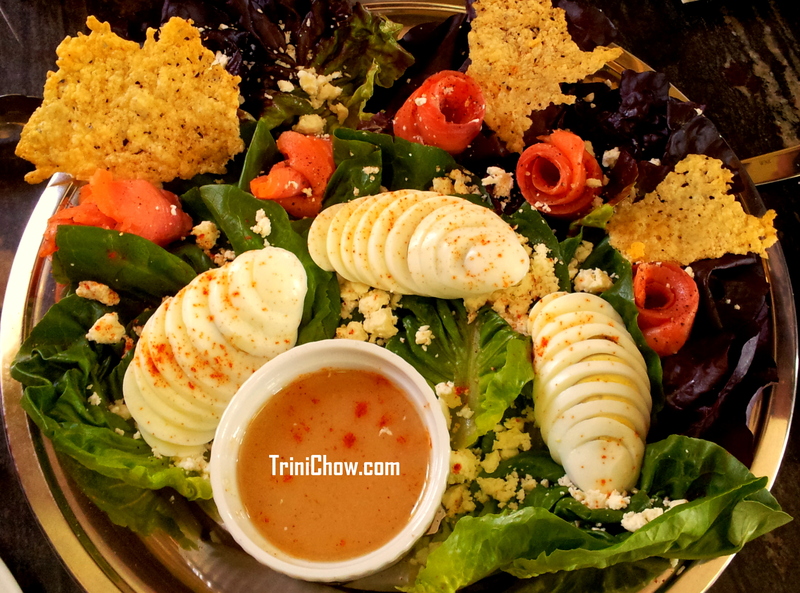 After taking tons of pictures, we stormed the salad, trying to get pieces of smoked salmon, egg and lettuce onto every forkful. Our inner voice is saying “pace, pace,” as we gorge on the salad (well really just too much salmon and eggs). Groaning ensues upon the appearance of the next two courses, the Tandoori Shrimp and oh yeah, the Snow Crab Legs served with a side of Herbed Garlic & Chardonnay Butter. 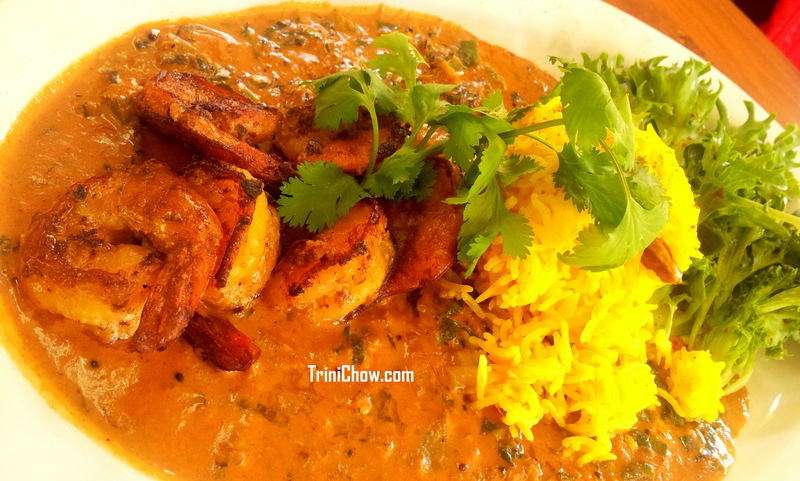 Let’s start with the large plate of Tandoori Shrimp, which came with a side of basmati rice. The tandoori-style shrimp was as yummy as always, but the aromatic sauce (which wasn’t even mentioned on the menu) was the truth! You could smell the sauce as soon as the plate hit the table, and now that the month of April is over, we can safely say that this PECHE dish was the highlight of the month for us. Next up were the Crab Legs with Creamed Cassava. Corey kicked off our crab fest by graciously sharing her knowledge of all things crab legs including how to efficiently remove the meat from the shell and we were off. As you might imagine, the Crab Legs were a hit. Food coma symptoms were starting to appear around the table but there was more food to come, so on we soldiered. 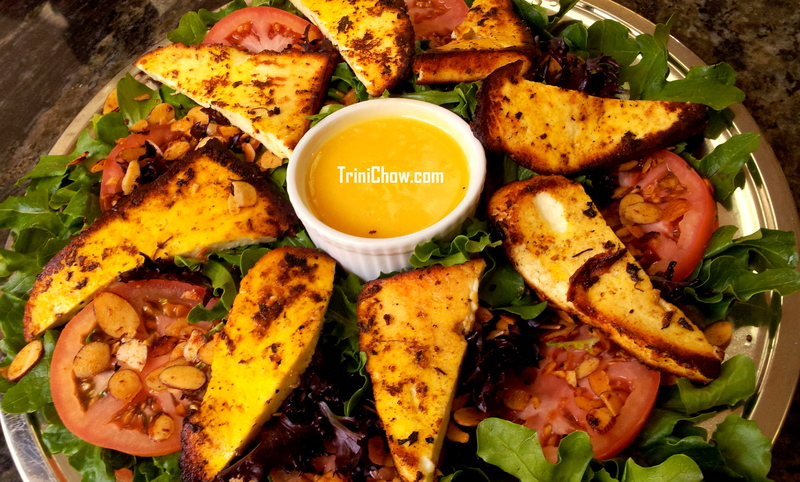 The Paneer Salad came at some point but we couldn’t taste it due to a pesky food allergy. Here’s a picture and description — East Indian spiced paneer, greens and a honey & chat masala vinaigrette. We closed our T&T Blogger’s Table feast at PECHE PATISSERIE with desserts, many of which we have previously enjoyed. 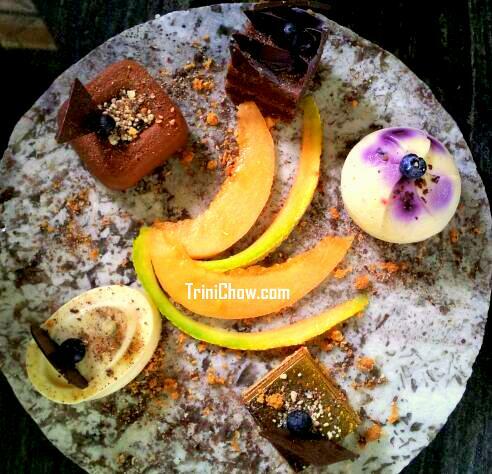 To us, PECHE has a the best tasting and most beautifully presented desserts in Trinidad and Tobago. Thank you to Chef Khalil Ali, Alan (Peche’s excellent sous chef) and the rest of the staff at PECHE PATISSERIE for hosting us! Also, check out Corey’s post on our visit to PECHE. Tags: T&T Bloggers' Table. Bookmark the permalink. 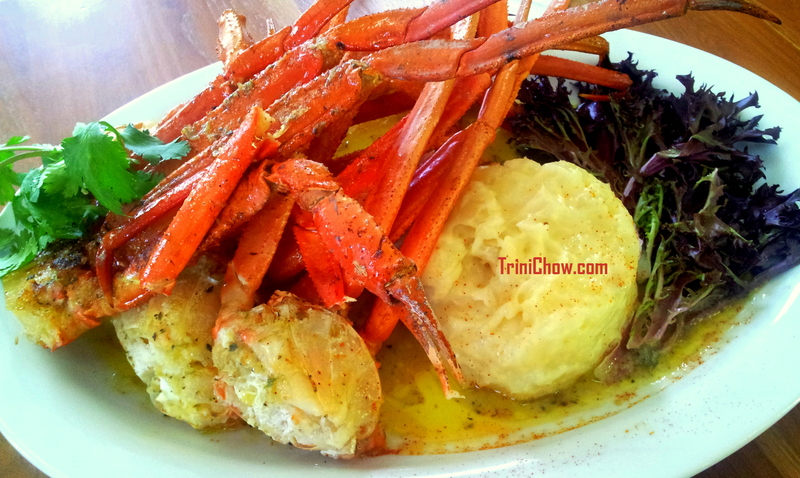 Previous post ← Talent on a Plate (and in a glass): Trinidad & Tobago National Culinary Team! Love how diverse these restaurants are in Trinidad. The crab legs and creamed cassava had me drooling. The crab legs & creamed cassava were delish!